Hostmysite.com :: How do I import/export email contacts in SmarterMail? How do I import/export email contacts in SmarterMail? The following article explains how to import/export email contacts in SmarterMail. Contacts can be imported from either a vCard file (*.vcf), a comma-separated file (*.csv) or a zip archive containing any combination of VCF and CSV files. Contacts can only be exported into a vCard file (*.vcf). When exporting contacts, you have the option of exporting all contacts, or specific contacts. Mouseover Import/Export and click Import Contacts. Browse to the file on your local machine. Once the contacts are done importing, they will appear in your contacts list. Mouseover Import/Export and click Export All Contacts. If you prefer to export individual users, check each user and select Export Selected Contacts. 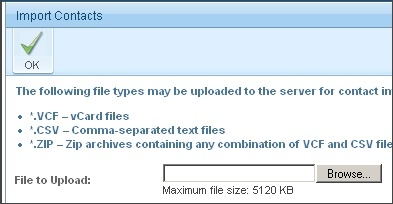 If a single contact is being exported, a .vcf file will be created with the user's name. If multiple contacts are being exported, a .zip file will be created called vCards.zip.